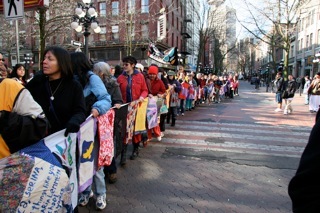 Courtesy photo used with permission from the February 14th Women’s Memorial March committee (showing the movement marching through Vancouver’s Downtown Eastside, 2005). I wrote another column encouraging folks to pay attention to the ongoing violence against indigenous women. One of the things I dread most are the conversations I have with my 5-year-old daughter about keeping herself safe from unwanted attention. She is a beautiful Lakota/Anishinaabe child, and unfortunately that means she is bombarded on all fronts by the very real possibility of physical, emotional, and spiritual violence. I don’t know that any parent relishes the idea of going over “worst case scenarios” with their child, but as a survivor of childhood and adolescent abuse, I am even more sensitive to the dangers of having an uninformed child, so we talk daily about ways to keep herself safe. There are a lot of great resources available to help parents word these discussions, but the point here is that we HAVE to keep this discussion in the forefront throughout our daughters’ lives. Too many indigenous women suffer from violence and too many of our issues suffer from exploitation, so much so that we fade easily into the shadows where no one can see us. Do yourself and our indigenous daughters a favor and support the work of groups like the February 14th (First Nations) Women’s Memorial March and the Turtle Island solidarity events fighting to keep our women, their protection, their survival, and their successes in the forefront. Wopila tanka; anpetu cante wasté. 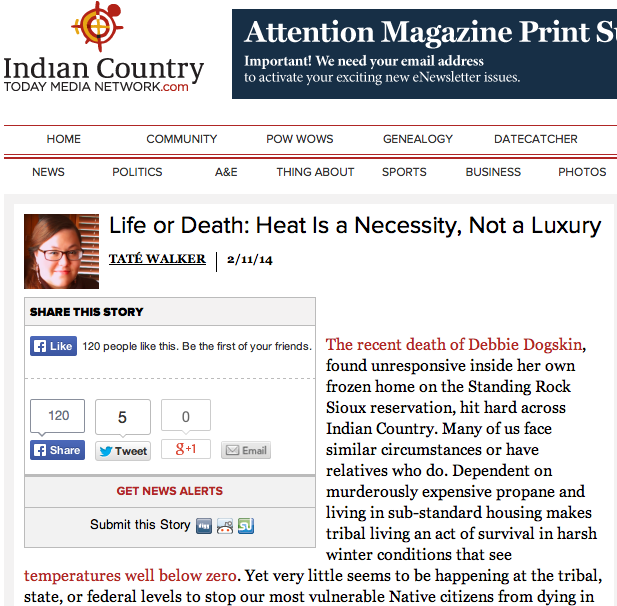 Indian Country Today Media Network ran my op-ed piece today to spread the word about the propane crisis affecting thousands of tribal citizens like my elderly grandmother. Please check it out, share, and consider donating to one of the sustainable (and indigenous) projects listed in the piece. Mad props goes to Sustainable Digest for originally posting a version of this column on their blog last week. Here’s a link to a blog I wrote for Sustainable Dakota. The death of Debbie Dogskin in Standing Rock hit hard, especially when I think about my tiospaye and the daily struggle to survive in harsh weather conditions back home in Cheyenne River. It could be any elder, any child, anyone who we find next frozen to death in their own home if we don’t take action NOW to build sustainable tribal homes and communities.